Which Is Better to Farm? Barbarians or Barbarian Forts? Barbarians are one of the neutral units in Rise of Kingdoms. You first encounter them during the very beginning tutorial, right after you find your city base. You can easily find them everywhere on the map, throughout your Kingdom. They ever attack anyone first until they get attacked. There are a lot of Barbarians living in the Barbarian Forts. Attacking Barbarians cost action points. Killing Barbarians gives your Commanders XP, resource items and Tome of Knowledge Books. At the beginning, only Barbarians level 1 are able to be attacked. After defeating level 1 Barbarians , you will be able to find level 2, 3, 4 and so on via the Search button on the map (located at the bottom left of your screen when you zoom out). During the first days of the Kingdom, Only Barbarians level 1→12 are available. The higher level Barbarians will be unlocked incrementally throughout the Kingdom’s subsequent days. When you search for Barbarians level < 12, If there isn’t any near your city hall, they will be spawned immediately beside your City. Barbarians level 12 and above spawn randomly on the map. You can send multiple armies to the same Barbarians target to kill them a lot faster while having the exact same rewards as when you attack them with just one army. Sending multiple armies to farm Barbarians is a nice trick not almost players know. Barbarians are original inhabitants of this land. They are strong, savagae and militant. war is the only way to force them to surrender. You will only suffer minor losses from attacking Barbarians. All slightly wounded units will recover once they return to the city. Attacking Barbarians will expend action points, but action points will recover overtime. 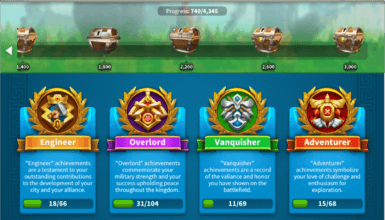 All Armies evolved in the attack will receive rewards after a victory, so we suggest you send multiple armies or attacks together with your allies. Attacking Barbarian Forts are the main source of getting Book of Covenants. They also give a great amount of XP Books, resources and Alliance Gift Box Keys/Points. 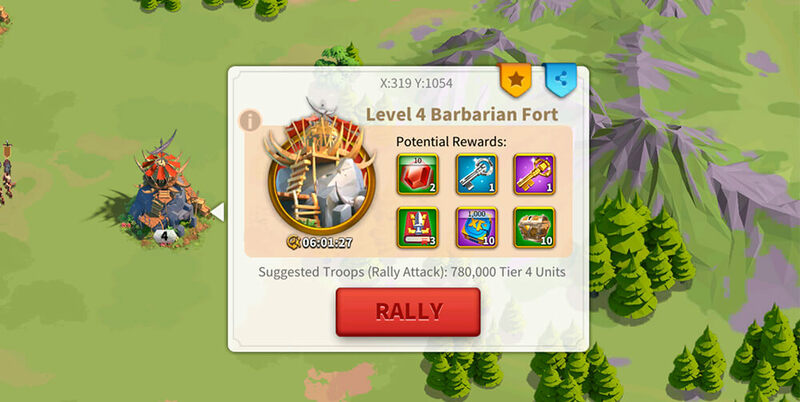 You can only attack Barbarian Forts by making rallies. This is why you need to upgrade your Castle in order to attack high level Barbarian Forts. It is always recommended to attack the Forts with the recommended army. 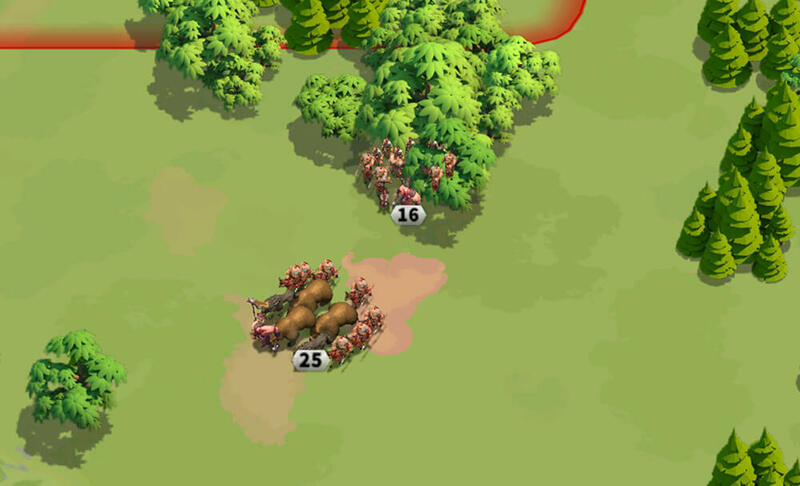 When a fort is destroyed, all armies involved in the attack will receive rewards. Armies which dealt more damage will receive greater rewards. Barbarians Forts are garrisoned by countless warriors, so their attack will not decrease during the battle. Barbarians Forts must be destroyed in a single attempt, or nearby barbarian troops will immediately replenish any losses. Note: It is always recommended to attack Barbarians Forts with at least the amount of Suggested Troops. I believe that almost all Rise of Kingdoms players always think about this question at the beginning. Fehler have set down some nice information for us here from over 250 battle reports with both Barbarian lvl 21-25 and Barbarian Forts level 4-5. He have divided the data into some sections here for us to understant it easier! After the normal Barbarians battles, you will get the same amount of XP Points. The same amount of Action Points gives you the same amount of XP Points. 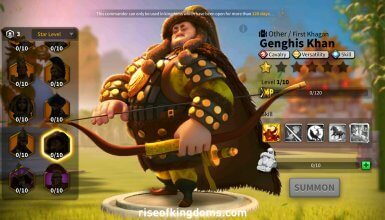 The XP you getting from attacking Barbarians will be spitted into 2 Commanders in an army. While Barbarian Forts give you XP books and you can use them on any Commander you want. This is great when you want to focus on leveling up a specific commander. Note: The Experience Runes only apply to Barbarians, not Barbarian Forts. Although the Gem drop rate is uncertain right now but undoubtedly Barbarians hunting gives you more Gems than rallying Barbarian Forts. Barbarian Forts give you Brand-new Starlight Sculptures. Barbarians could only give you Blue and Green Stars. So Forts are definitely better. Barbarians give guaranteed 5x 1-minute Speed-Ups for either training or universal queues, with a chance of getting 5x 5-minute Speed-ups. 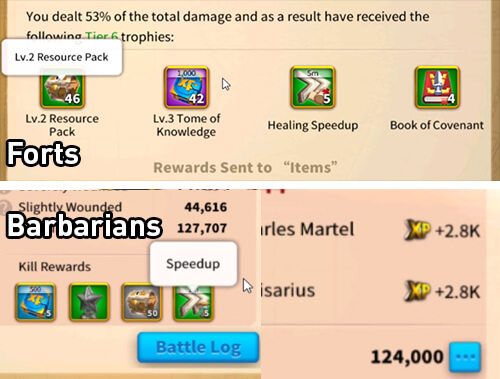 Barbarians Forts’ rewards are based on your reward tier, should be from 10-30 minutes of general or Healing Speedups. In general, Forts give much better Speed-Up rewards. Barbarians have a low drop rate on Arrow of Resistance. Farming Arrows via this way is not really reliable. Attacking Lohar and Thief give way more Arrows. Forts give 4-5x Books when you host the rally and the drop rate is also very good. You want to focus on attacking Forts as it helps you upgrade your Castle. Barbarian Forts require a lot of time to farm (at least 5 minutes for the preparation), but give you at least 380k resources each time in form of Chests. This is more than you can earn from farming at the same rate. For the same amount of action points, Barbarians only give half of the rewards. 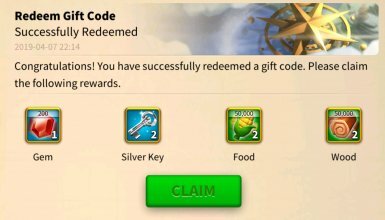 Attacking Barbarian Forts also contribute to the Alliance Gifts, which contains some seriously nice rewards. During the normal days, spending Action Points on Barbarian Forts is a lot more efficient. However, when there are special Events like Lohar, Thieves, where you could earn rewards from farming Barbarians, spend your rewards on them! If you join rallies hosted by others, there are times you cannot send a full army as there is not enough space. Also, only two Commanders of the one who hosts the rally activate their skills, allowing him/her to contribute the most damage in the rally. Thus, you should work on your Castle more if you want to gain the best benefits from attacking barbarian forts. Another benefit of attacking Barbarian Forts is going through the Alliance Gifts. As you defeat Barbarian Forts, you are able to gain some nice rewards here. It just constantly stacks up for the Chest. The Chest isn’t just going to be for you, it is going to be for the entire Alliance. So this is one way to support your Alliance and not just that, once you’re doing Barbarian Forts. you’re also going to level up your Alliance Gift. Everyone participate in the rally attacking Barbarian Forts is guaranteed to receive the XP Books, Resource Boxes and the Speedups. If lucky enough, you will get Gems, Silver Keys, Gold Keys or Brand-new Starlight Sculptures additionally. The more damage you done, the better rewards you get. Higher level Barbarian Forts give better rewards. There is a 50% chance to get the Book of Covenant.